Spanning the arch of Cambridge Street along the top portion of the plaza sits One, Two, and Three Center Plaza, or as it is more commonly known, Center Plaza. This long crescent-shaped building was one of the last completed as a part of the redevelopment of Government Center, and houses a mix of retail, commercial, and governmental office space. From here, looking back over City Hall Plaza you can see City Hall, the JFK Building, and the new Government Center T stop entrance, a large glass and steel structure. The T stop, designed in partnership by the MBTA and Boston Redevelopment Authority, is slated to open Spring 2016. Until then, a large portion of the plaza will remain a construction site. 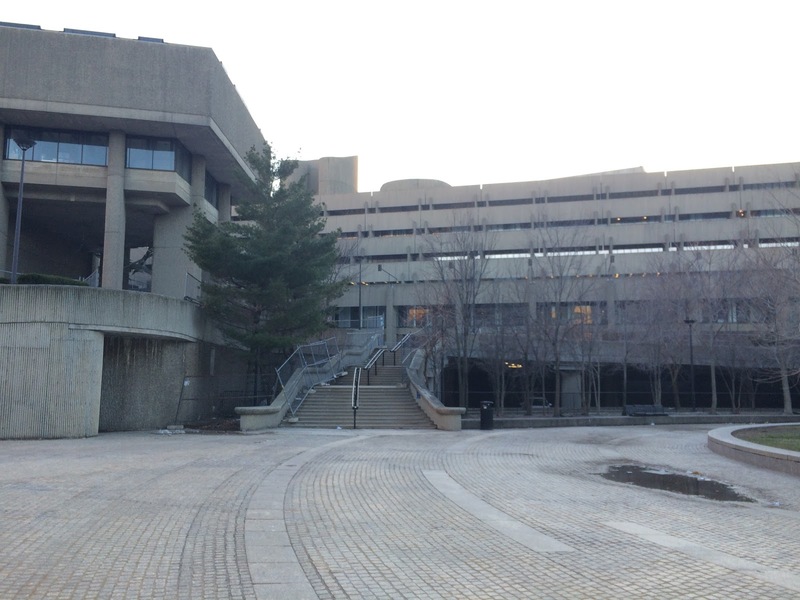 The last building of Government Center I visited was the notorious Government Service Center, designed by Paul Rudolph. Walking west along Cambridge Street brings you past the John F. Kennedy Building Towers and the Bowdoin Blue Line T Stop to the corner of New Chardon Street. Here sits the other concrete monolith Bostonians so love to hate. The building is comprised of two linked parts, one for unemployment services and the other for mental health services. Completed in 1971, after a five year construction process, the building is recognizable for Rudolph’s signature “corduroy concrete”. Walking around and through the central courtyard of the building paints a picture of severe structural neglect and a lack of upkeep. The multi-tiered central courtyard is now intersected by chain link fences. The large planters are trash-ridden and show little life at all. The courtyard has also become a refuge for vagrants and homeless people. Because of all of this, many of Rudolph’s playful staircases and access points have been barricaded. The passageway still open along the Suffolk County Court Building takes you to Staniford Street, where you can really appreciate the details of Rudolph’s work. Loved by fans of Brutalist architecture and hated by nearly everyone else, it is difficult to tell the fate of Government Service Center, but you definitely need to go take a walk around for yourself to decide. 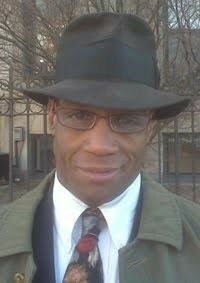 My quick visit to Government Center was not my first, nor my last trip around the area. The complex is rich in history both in the architecture that exists there today, and the architecture that once stood before it all. While Scollay Square is no more, there is ample research and documentation on it, especially here at our own BAC Library. 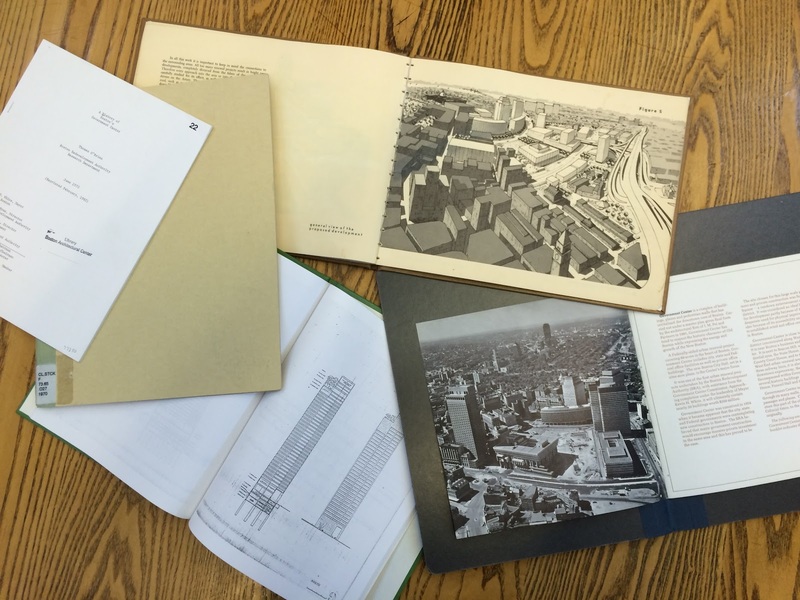 Likewise, the library has a multitude of original contracts and plans for the construction of Government Center. They also have original scaled construction documents for City Hall and a few of the other buildings. While I barely skimmed the surface of what is to be seen at Government Center, an even limited understanding of the place begs the question of original design intent. 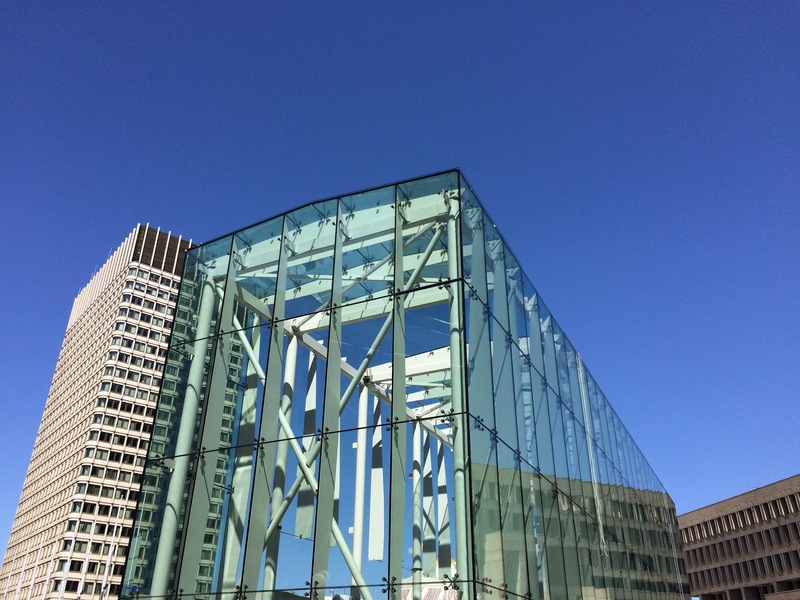 Some have called Government Center the worst development of the past century, and yet others staunchly defend it. Go take a look around and decide for yourself. The project was originally thought up to reinvigorate the city. As more people left the city for the suburbs, Boston sought to breath new life into its downtown core. Despite such intentions, Government Center has largely failed to meet the needs of the people of Boston, both then and now. As a designer you might ask yourself, what is the future that you are designing for?